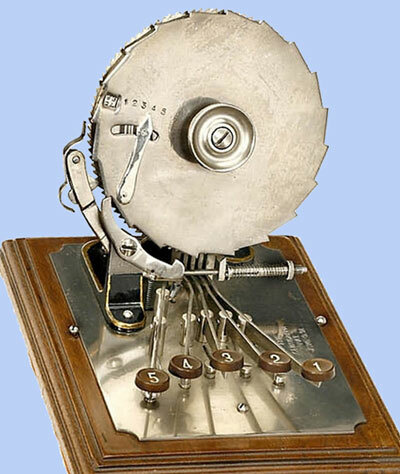 Arthur E. Shattuck of San Francisco, California, was a holder of 4 USA and 1 Canadian patents for calculating devices. The first (№268135 from 1882) and second (№349459 from 1886) patents (received along with Charles Thorn) are for chain adders, which never reached the market. 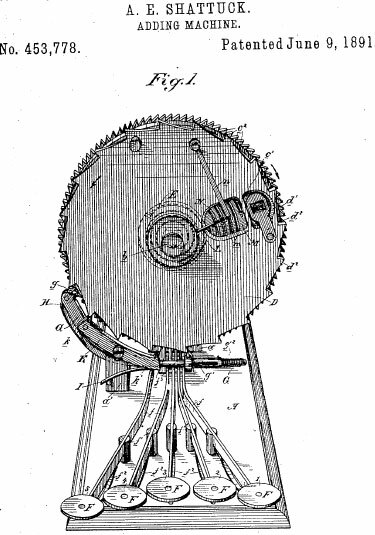 The third (№363972 from 1887, along with Brainard Smith) and fourth (№453778 on June 9th, 1891) patents (see the lower patent drawing) however, were for a simple 5-key single-column adder (similar to the earlier adders of Marshall Cram and Lawrence Swem), the second version of which will be manufactured and sold in small quantities in 1890s under the name Centigraph Adding Machine (also Centigraphe and Centagraph) by the company American Adding Machine Co., Atlanta. It was a metal device, mounted on a wooden base, with measurements (cm): length: 15.3, width: 20.6, height: 15. The operation is as follows: Pressing the keys, the plate D is so turned, that through its aperture the ciphers are seen. For the digits over 5 two keys (marked with F) must be presses simultaneously (for instance for 6, 5 and 1 must be pressed), whereupon plate C moves one number to the right, and plate D moves five numbers to the left, and in the aperture figure 6 is seen. The plate can counter to 99, but there is a separate 5 positional pointer for hundreds, which allows the sum to reach 599. Arthur E. Shattuck is also a holder of another US patent (№1029236 for a carbonator). So, who was the inventor—Arthur E. Shattuck? Arthur Ewing Shattuck was born on May 16, 1854, in Petaluma, Sonoma, California, as the first child (of six) of Francis (Frank) William Shattuck (1828-1893) and Aletha Olivia Ewing Shattuck (1834-1882). Francis (nickname Frank) William Shattuck was born on February 15, 1828, in Dupin County, North Carolina, and came to California along with his family in 1849, when the discovery of gold was drawing to this section of the US men from all parts of the country. He located in Petaluma, San Francisco area and became a lawyer, just like his father David Olcott Shattuck (1800-1892), an eminent lawyer and the first judge of the superior court of San Francisco. Frank Shattuck practiced law for many years, serving as a notary and County Judge of Sonoma county. Frank Shattuck married to Aletha Olivia Ewing, born in Missouri, on July 15, 1853, in Sonoma Co., and the next year was born their first child, Arthur Ewing. Arthur Ewing Shattuck (see the nearby portrait) acquired his early education in the public and private schools of Petaluma, California, and at the age of sixteen put aside his textbooks to enter upon a business career. When he was eighteen years of age he was appointed deputy county auditor, but on account of his youth he was retired from public office until he had attained his majority, when he was appointed deputy county clerk of Sonoma county and served in Judge Temple's court for a number of years. It seems during his service as a county and court clerk in 1880s Shattuck invented his adding devices, the object of this article. Subsequently Arthur Ewing Shattuck became a member of the editorial staff of the Santa Rosa Democrat, a daily newspaper, then published by Thomas Thompson, who was later appointed to the position of United States minister to Brazil, and when in 1892 when Thompson became secretary of state of California, he appointed Shattuck as his assistant, and the latter largely had the management of the office until he resigned in 1894 in order to devote his attention to private business interests in San Francisco. He was appointed to the position of state's prison director, and upon the expiration of his term he joined his brother William F. Shattuck in a manufacturing enterprise in San Francisco under the firm name of the Pacific States Type Foundry, of which he has was secretary/treasurer and then president for ten years. In 1895 Arthur Shattuck married to Margaret Sharp, a native of Sacramento, California. They had two children, Margaret Ledeane and Kathryn A.